… you may need chiropractic care! Even a minor automobile accident can have major effects on your health! 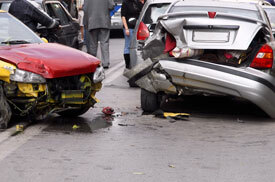 When one automobile is struck by another, thousands of pounds of force are exerted on the neck and spine. Whiplash occurs when the head and neck are thrown or “snapped” back and forth very quickly. The painful result is injury to the ligaments, soft tissue, and the discs of the neck and spine. If you have been in an automobile accident you may need chiropractic care! Whiplash also causes impingement, stretching, or irritations of the nerves and the spinal cord. It can cause headaches, numbness, pins and needles in the face, chest, arms or hands, anxiety, neck pain, back pain, ear ringing, dizziness, hearing loss and/or blurred vision. Too many people who have been in a traumatic automobile accident do not receive chiropractic care. That is the reason why over half of accident victims never completely recover from their injuries and may live on pain killers for years or endure repeated surgery. Chiropractic care can make the difference between true recovery and healing or lingering pain and disability. Unfortunately, chiropractic is not yet available in emergency rooms and medical doctors are not trained to locate and correct spinal nerve stress. As a result, millions of accident victims leave the hospital with as much spinal nerve stress as they had when they entered. They may continue to suffer for months, years or even decades afterwards. At Larger Life Chiropractic we offer “The Gentle Touch That Makes The Difference.” Gentle S.O.T. Chiropractic Technique emphasizes a non-traumatic, non-forceful approach for human health care. This gentle chiropractic care helps restore nervous system function, helps to heal sore muscles and damaged ligaments, and ensures rapid and complete recovery after an accident. Insurance companies realize the many advantages of chiropractic care. This treatment is generally covered in full by automobile insurance policies, whether you are a driver, passenger or a pedestrian…and regardless of who is at fault. Our clinic will assist you in dealing with the insurance paper work and filing a claim with your insurance company. Anyone who has been in a traumatic automobile accident, even if there are no obvious symptoms should have an S.O.T. chiropractic examination. The damage from spinal nerve stress may take months or even years to surface. A simple chiropractic exam and proper treatment can save an accident victim from much pain and disability later. Call Larger Life Chiropractic today at (508) 481-6351 for an appointment or to discuss any aspect of your post accident healing process if you have been involved in an automobile accident.